The only “Spin” here is REALLY provided by the rifling of the barrel. if you are looking for the blog address, click here. I do not accept advance payments for any items that are not in stock but I now offer a Watch List. Send an email to USCitizen (at) Well-RegulatedMilitia (dot) com with the exact stock number you are looking for and I'll contact you when it is available! Fill out order information; then fax to place your order. 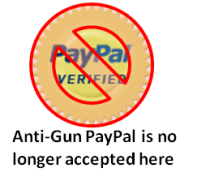 We also accept certified checks and postal Money Orders. 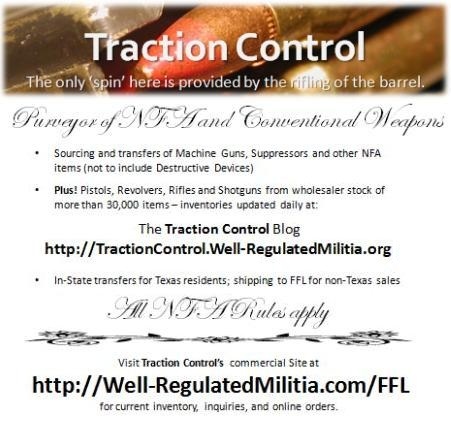 The proprietor of Traction Control is a Federal Firearms Licensee (FFL) for Class III weapons purchases and transfers to qualified persons in the State of Texas. If you are out of state, give us a call and we can order the weapon and have it shipped to a qualified FFL in your area. There is normally a transfer fee, charged by your dealer involved with interstate transfers. 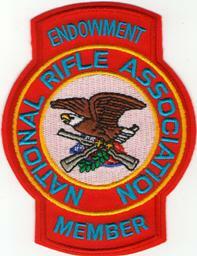 for assistance in locating or ordering firearms. Contact me for details about specific models and pricing. I can also help you to locate other hard to find and "more interesting" items. I can perform sourcing to your requirements and facilitate payments online, however all transfer paperwork and physical deliveries of firearms must be made in person or via an FFL in your area. E-Mail me at the address above to let me know what you are looking for. We can start the process online. All orders will be prepaid. Items requiring BATFE approval (Class III) will be held until all paperwork and taxes have been accepted and approved. Section 925(a)(1) of the GCA exempts law enforcement agencies from the transportation, shipment, receipt, or importation controls of the GCA when firearms are to be used for the official business of the agency. An individual law enforecement officer's receipt and possession of firearms for use in carrying out official duties on behalf of an agency is also exempt, unless the officer has been convicted of a misdemeanor crime of domestic violence. If a law enforecement officer is issued a certification letter on the ageny's letterhead, signed by a person in authority within the agency stating the officer will use the firearm in performance of official duties and that a records check reveals that the purchasing officer has not been convicted of a misdemeanor crime of domestic violence, the officer specified in the certification may purchase a firearm [from the licensee] regardless of the State in which the officer resides, or in which the agency is located. Form 4473 completion and NICS check (Brady Law compliance) are not required for purchases made pursuant to such letters. Dealer samples are not transferable to individuals and are not available to individuals for any purpose. It is a not widely known, but machine guns can be owned by law-abiding citizens. Certain laws have made purchasing a full-auto gun more difficult than purchasing a "normal" gun, but you can comply with these laws and own a machine gun. Laws that went into effect in May, 1986 made it illegal for 'civilians' to own fully automatic firearms that were manufactured AFTER THAT DATE. Most fully automatic weapons manufactured and registered BEFORE May, 1986 MAY BE OWNED BY AND SOLD TO INDIVIDUALS. The full-auto guns that may be owned by individuals are called 'transferable'. To purchase a transferable machine gun, you must meet certain requirements (generally the same as when you purchase another gun), fill out special paperwork (called a 'Form 4'), and pay a $200, one-time, transfer tax. Every time a machine gun is transferred, the $200 tax must be paid -- usually by the purchaser. Find a local dealer to can assist you in all phases of the transfer. This should go beyond helping you fill out the paperwork; they should also be able to help you locate the gun and allow you to shoot it while your paperwork is being processed by the Bureau of Alcohol, Tobacco, Firearms and Exposives. It usually takes 4-6 weeks for the dealer to get a gun from another dealer if they don't already have it in stock (due to BATF paperwork delays). Get your fingerprints (either by your police department or other qualified entity). Two imprints are needed and two passport-size pictures will be required. These will be used to perform a comprehensive criminal background check on you. Have your local dealer help you fill out an "Application for Tax Paid Transfer And Registration Of Firearm" form, known as a "Form 4". You must have the signature of the Chief Law Enforcement (CLEO) officer that has jurisdiction over the municipality in which you live on the Form 4. This could be the City Chief, the County Sheriff, or a Judge with Criminal Court jurisdiction. This is usually not a problem in machine gun friendly states. Your Dealer will mail the Form 4 with CLEO signature, 2 fingerprint cards, 2 pictures, and your $200 check to the BATF. When an approved tax stamp is returned, you may take possession of the gun. This may take anywhere from 2 to 5 months. Although it may seem complicated, I will be happy to help you through every step in the process. I can also use a network of dealers in other states to the gun you are looking for. The process outlined above is the same for Suppressors, Short-Barreled Shotguns and Short-Barreled Rifles. Click image for Order Form. Fill out order information; then fax, mail, or scan and email form to place your order.